ALEXANDRIA, VA—Global business travel spending reached $1.33 trillion in 2017, advancing 5.8% over 2016 levels, according to the GBTA BTI Outlook – Annual Global Report & Forecast, a new report released at GBTA Convention 2018 by the Global Business Travel Association. Spending is forecast to advance another 7.1% in 2018 and will expand to $1.7 trillion by 2022. 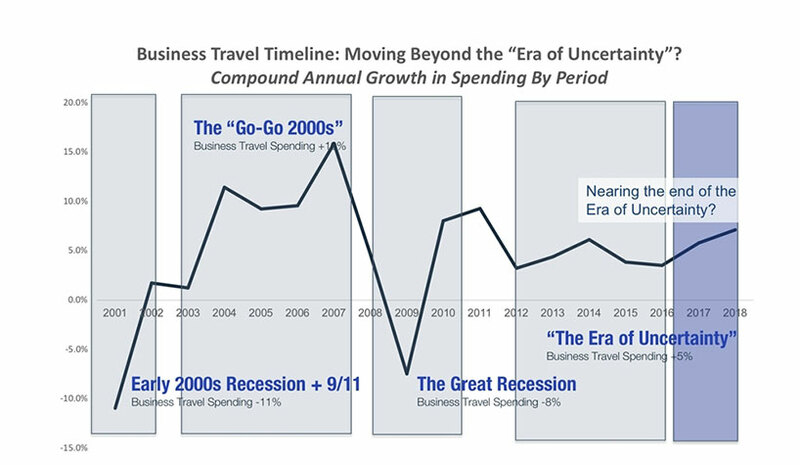 The “era of uncertainty” has been punctuated by moderate growth in business travel spending, which has been trapped in roughly the 3-5% range annually since 2012. The two-year period spanning 2017-2018 is projected to be the strongest two-year period for business travel since the initial recovery from the Great Recession in 2010 and 2011. In 2018, GBTA expects 18 out of the top 20 business travel markets to outpace their growth average over the last five years. On average, GBTA projects global business travel to expand by 5.2% over the forecast horizon. The current high-growth business travel era has been fueled by improving economies around the globe. Many of the improvements, however, have been ignited by both monetary and fiscal stimulus, which is likely to lead to policy challenges and slower economic growth down the road. The potential for trade wars is the biggest global risk that GBTA is watching. Drastic increases in tariffs and associated retaliatory measures could have detrimental impacts on the global economy and the global business travel market. An analysis of the mathematical correlation between the two shows nearly 60 percent of the variability in global business travel spend can be explained by global trade volumes. “Intuitively, this makes sense as the movement of goods and services necessitates people, namely business travelers, to support global commerce,” added McCormick. Business travelers in Western Europe generated $310 billion in total business travel spending in 2017. The region saw 4% growth over 2016 levels including 5.6% growth in Germany, 3.9% in France and 6.3% in Spain. The only major drag on the Western European business travel market has been the U.K., which declined -0.7% last year. The decline in Britain has been driven by the fallout from the Brexit vote—a weakening pound, increased inflation and the associated pressure on consumer spending. GBTA projects moderate to strong growth over the forecast horizon in Western Europe with Germany, France and Spain all growing their business travel markets in the 4-6% range. The biggest downside risk for the region, however, comes from the British business travel market, as the health of the market will hinge on the final terms of Brexit negotiations. GBTA projects India and Indonesia to be the fastest growing markets over the next five years, picking up 11.3% and 8.7%, respectively. These two markets continue to show enormous growth potential. The next fastest-growing major business travel markets will come from Scandinavia as both Sweden and Norway are projected to grow significantly faster than average—6.8% and 6.6%, respectively. Despite the slowdown in China’s economy, the Chinese business travel market is poised to be the fifth fastest-growing market in the world over the next five years, picking up an additional $129 billion in annual business travel spend by 2022. China remains the world’s largest business travel market and will continue to distance itself from the rest of the world. Formerly the world’s largest market, the U.S. business travel market is projected to grow slightly below the global average over the next five years at 3.9%. The top 15 business travel markets remained largely unchanged from last year, except for India surpassing South Korea for seventh on the list. India is projected to crack the top five by 2022. The regional share of global business travel shifted only slightly since last year’s outlook, with Asia Pacific picking up 1% of market share and North America losing 1%, while shares in Europe, Latin America, the Middle East and Africa remained largely unchanged. GBTA expects the Asia Pacific region to gain another 2% of market share by 2022, while North America is expected to lose an additional 1%. When breaking the world’s major business travel markets into segments, another impending shift is coming, according to the study. The stalwarts make up roughly half of the global business travel spending market today and are comprised of many of the world’s major economies. India, China and Indonesia, once considered emerging markets, now form their own segment and continue to grow at an extremely rapid pace. This segment will pick up ground on the stalwarts over the next five years, gaining $164 billion in annual spend by 2022. GBTA projects this segment to be the largest in the world by 2035.